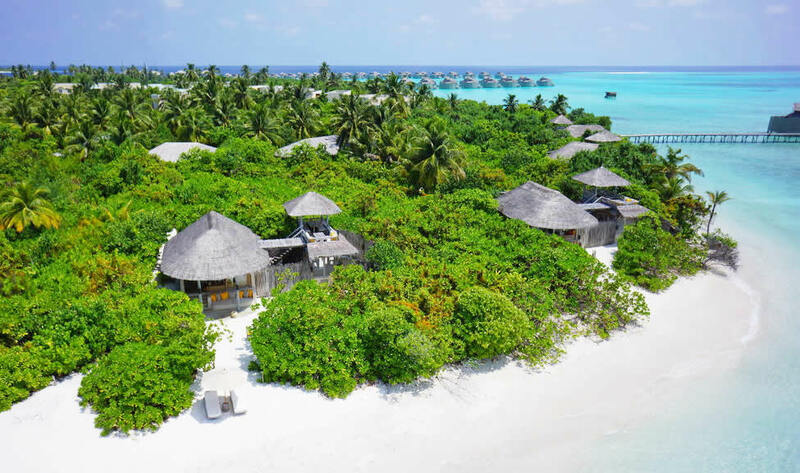 Six Senses Laamu is the only resort located in the Laamu atoll, which lies in the southern part of the Maldives. Surrounded by the Indian Ocean, the island is of outstanding natural beauty, powder white sand, lush tropical vegetation and crystal clear waters. The resort prides itself on its commitment to sustainable operations and development mix design aesthetics with technological excellence to create a new epitome of barefoot luxury. One of The Maldives more remote properties, Six Senses Laamu requires a bit of extra effort to reach. Yet as one of the island nation's very finest hotels, it's absolutely worth it – fabulously expensive, and also generally fabulous. 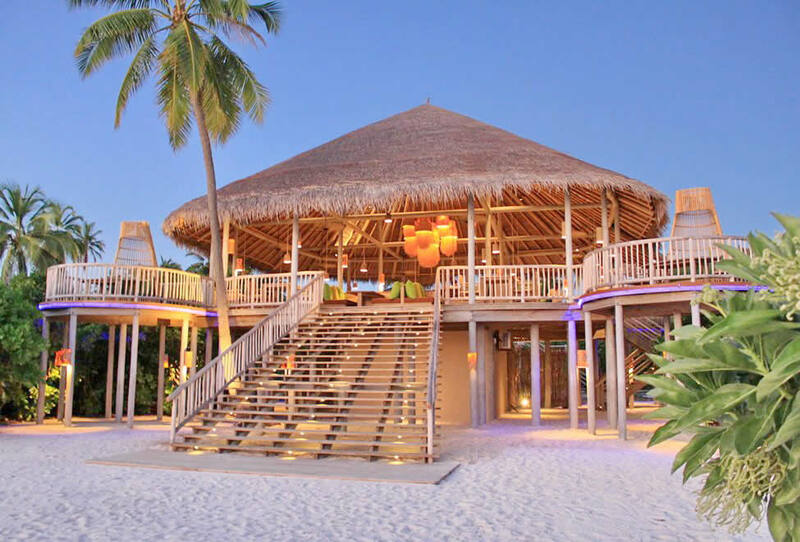 Olhuveli Island has become home to Six Senses Laamu, opened in April 2011. Another who wants to be more beautiful than any others, and who accepts the philosophy of ecological luxury inherent in the hotels of the Six Senses group is fantastic. And it's not missing, there's more than magic. 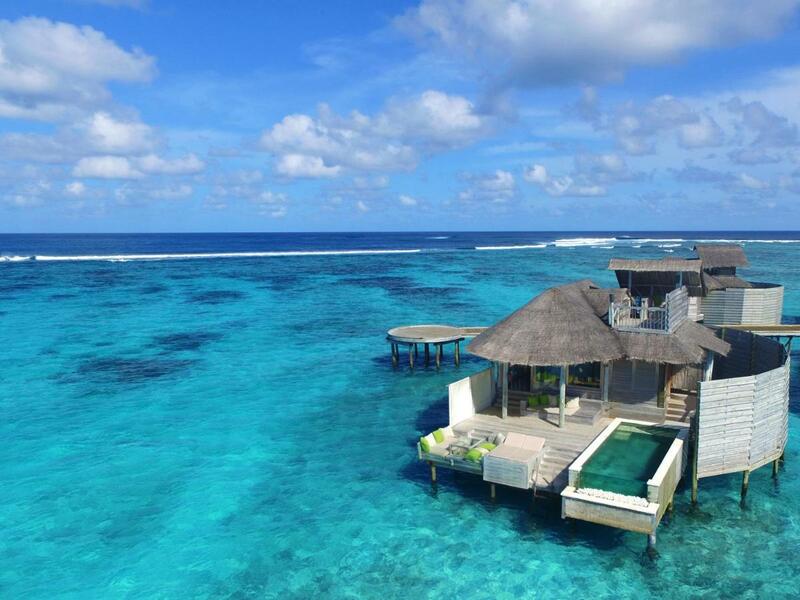 At Six Senses Laamu, most of the villas and facilities are built overwater. However, beach villas and on-land dining is an option. An eco-friendly, yet luxurious in every way all villas offer a sense of privacy and seclusion, with an amazing view to the Ocean and Maldivian nature. Six Senses Laamu offers a wide range of dining options, with cuisines from around the world, a swimming pool with a sunken bar, an ice cream parlour, an overwater wine cellar and a signature Chill bar. The bars and restaurants offer the best organic, fresh food, locally grown and caught, cocktails inspired by original ‘tropical' recipes, over 400 wines kept in a climatically controlled towering glass wine ‘cellar' and fun, live music, visiting DJs and mixologists. Many activities, excursions and options are available for everyone to enjoy, both overwater and underwater, in addition to the Six Senses Spa and surfing. Service is second to none, with Six Senses GEMs (Guest Experience Makers) overseeing every need from arrival to departure. A Six Senses host greets every Laamu bound guest on arrival at the Ibrahim Nasir International Airport. A domestic flight takes you to Kadhdhoo Airport, 45 minutes south in unspoiled Laamu Atoll where a speed boat awaits for the 25-minute jaunt over calm indigo waters to Olhuveli Island, home of Six Senses Laamu. A bit of a hassle, but completely worth it. From the moment you set foot on the boat towards the resort you feel that peace and calmness coming to you. The cold towel and the bottled water with a scent of the Six Senses signature lemongrass is just an amazing feeling. The second relevant thing is that this same moment you receive a bag where you can put your shoes and say goodbye to them for the rest of the holidays.You instantly remember why you decided to chose Six Senses Resorts again. The moment you arrive you are welcome by all of the staff at the arrivals jetty (starting by the Hotel General Manager), the GEMs (Guest Experience Makers and, at the end, your “best friends” to make your holidays become your ever dreamed holidays) and other relevant staff (diving team, surf team, beach sports team...). Your GEM escorts you to your Villa and ensures you that what ever it is that you might need they will take care of it. The peace and calmness you feel is worth every penny spent on the trip. No check in process, no credit cards, no nothing. Just relax and enjoy. The way the place looks, the way the place feels inspires a sense of well-being in everyone. It is not just the staff that smile but guests passing each other smile and say ‘hi' with no awkwardness at all. Woodwork features heavily, especially with the stilted ocean villas which stretch out from the island into the Indian Ocean. The public area is an over-water village, a waterworld of interconnected venues on different levels made of found materials: wood, rope, branches, thatch, worn telegraph poles. Yet nothing is disordered, the welcome and service is all drilled calm. This is rustic chic at its apogee. The island vegetation is more screwpine and hardwood than tall palms but although there is plenty of open sky as you walk around it's not filled in with imported shrubs and flowers. The beach has lovely deep, soft sand where most of the beach villas are on the southwest and south sides but is narrower on the other side where sensibly the 3 water villa jetties have been built. At the end of the day, there is no finer place to make you feel good than on a big mattress and pillow out over the water on a hammock, watching the sun set with a musical groove behind you coming from the bar Chill. The reef was badly affected by the great bleaching event of 1998 and knocked back by subsequent lesser events. A restoration project called ‘Plant a Fish' has been inaugurated by Fabian Cousteau. It involves grafting corals to create artificial reefs in the lagoon. This is not only valuable to corals and fish but also to guests who are not strong or confident swimmers. Marine life around the resort is great. Rays, sharks, turtles and a colorful fish play around the villas. The house reef is thriving - it’s just a few swim strokes away from the bar. And the villas overlook a sandy lagoon with sea grass patches where turtles like to hide. You will spent many hours in the water gawking at the undersea life. The spa is first rate and the snorkelling right off the villas is world class. For a real treat, it's possible to take a picnic lunch on a nearby deserted island which, for several hours, you'll have all to yourself. What really make this place unique is the staff! The staff - every single person is so friendly and helpful whether it's the person cleaning our room, managers, F&B director, marine biologists, dive instructors even the resident Ayurvedic doctor and the staff looking after the herb and vegetable garden or the staff in the restaurants. Great management team. Amazingly discrete but switched on and attentive without being formal or too informal. They are extremely freindly, making a wonderful atmosphere. All the GEMs build a good rapor with their guests and this is evident throughout your stay. All staff you interact with have a genuine peaceful and caring frame of mind that you always will remember and want to experience over and over again. 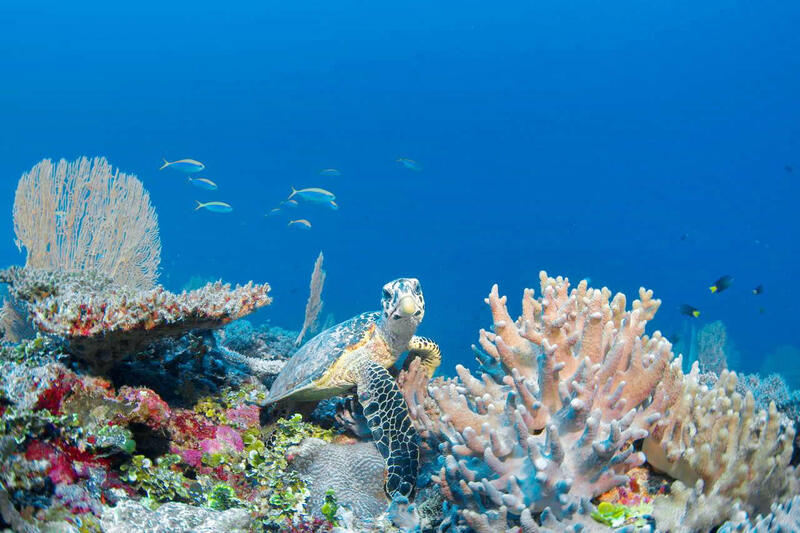 Similar to how responsible and caring the resort treats their environment, the 10-member marine biology team of Six Senses Laamu has pioneered a wellness programme for the colonies of corals that inhabit the house reef around the island. Seven hundred and forty carefully selected coral fragments of more than 10 different species from the house reef have been placed in a mid-water coral nursery. Just as it is the resort’s mission to help people reconnect with themselves, others, and the world around them, these corals will enjoy some rest and relaxation until they are grown large and strong enough to be replanted on the house reef. This project came into action in an effort to enhance the restoration process of bleaching effected coral reefs following the 2016 El Niño. Reefs in the Laamu atoll were affected albeit fortunately less when compared to some other parts of Maldives which experienced bleaching of nearly 70 percent of reefs. According to field experts, the natural recovery process of mass bleaching events can take up to 15 years and the marine team at Six Senses Laamu is dedicated to creating the best environment to facilitate the recovery process. Every week they receive pampering and cleaning treatment from the marine team, and are given the opportunity to grow without the stress of possibly being eaten by the predators. 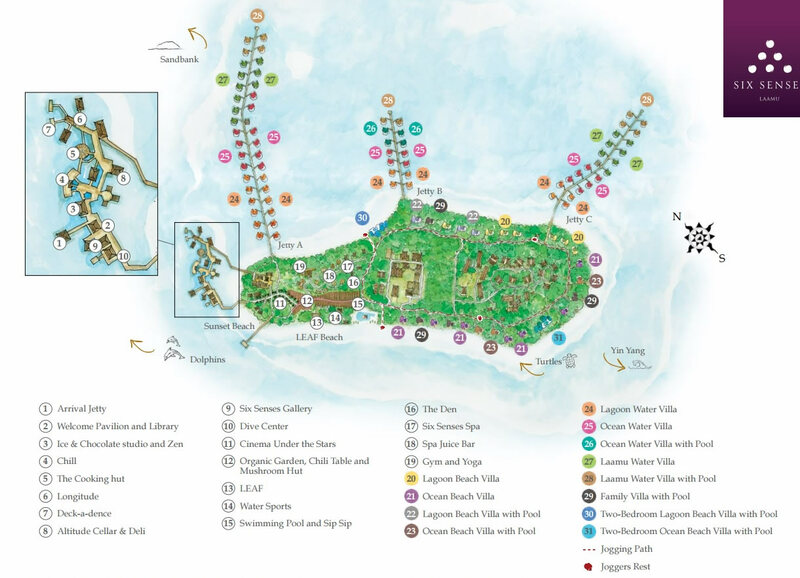 Like many high-end properties in The Maldives, Six Senses Laamu dominates its own island within an atoll. From Malé International Airport, it is just a 35-minute flight, along the beautiful Maldivian coastline to Kadhdhoo domestic airport. A short 25-minute boat transfer later and guests have arrived at the powder white sand and crystal clear turquoise water paradise which is Six Senses Laamu. 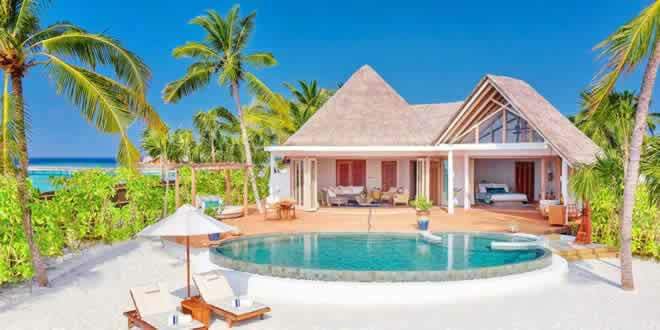 With an expansive one and two bedroom, 97 villas of magnificent, very local architecture are divided between Beach Villas, Lagoon Beach villa with Pool and Ocean Water Villas that shine with elegance in the green emerald or stand out on the azure. Villas are carefully designed to complement the outstanding natural beauty of the island, they offer utter privacy, comfort and luxury. True to its philosophy of environmental protection a wood and other natural materials reign in this nature-preserving paradise 100%, creating huge cocoons for Robinson, in love with luxury travel. The rooms are very spacious, airy with breezes and literally glow, enhancing the feeling of freedom and alienation from the rest of the world. Guaranteed full privacy! As in Gili Lankanfushi and Soneva Fushi, each room of the villas is equipped with couches and sofas with colorful cushions, inviting to immoderate laziness. All villas include: King or Twin bed as preferred, air-conditioning, Bose entertainment system, flat screen TV, minibar, phone, wifi, outdoor bathroom, hairdryer, safe, iPod docking station, tea and coffee facilities. Hidden between the lush tropical vegetation the Beach Villas are divided between Lagoon and Ocean. All villas offer absolute privacy, the beach with sun loungers is only a few steps away and Ocean Villas come with a fantastic sunset view. Lagoon Beach Villa (220m²) features a private access to the beach, private garden with daybeds, upper deck dining table at treetop level with viewing platform, views to the blue lagoon. All accommodation is placed strategically for sunshine and shade between the sparkling waters of the lagoon and the hideaway retreat. Ideal for families travelling with children, Beach Family Villa with Pool ( 253m²) is more spacious and suitable for spending some quality time together. Set between the posh tropical vegetation facing the sea it comprises a beach villa with the addition of a study which can accommodate up to two children and has an adjoining bathroom. This family hideaway features a private pool and private access to the beach, which is only a few metres away. Sun loungers are placed strategically for sunshine and shade by the pool. The master bedroom is only a few steps away from the children’s room and it has complete view of the swimming pool. A two-bedroom Beach Villa with Pool hidden between the lush tropical vegetation facing the lagoon is ideal for large families or couples travelling together. It comprises two separate and independent bedrooms with a private outdoor bathroom and a very spacious common living and dining room area located in between. 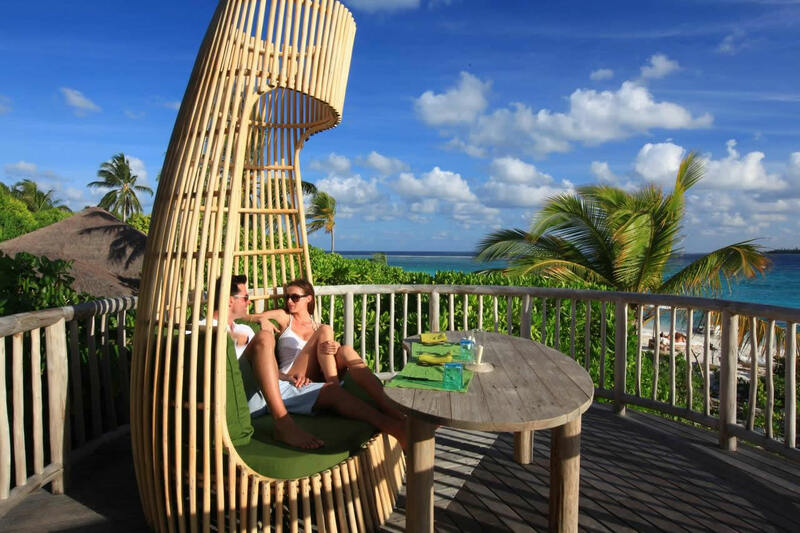 All Beach Villas at Six Senses Laamu are equipped with the treetop deck which features a comfortable seating and dining area. For a unique panoramic view of the Maldivian nature, sapphire seascape and for catching an unforgettable colorful sunset, you need just climb. For an ultimate over-water living experience, Ocean Water Villa is the best choice, where guests can jump off a jetty into the psychedelic reef below, or to stay put on a hammock just above the turquoise waters. All room options are spacious and make the most of natural materials: wood, hessian, leather, linen and thatch. Showers are outdoors (the water doesn't drain into the sea) but clever design allows for the utmost privacy. If you're a fan of snorkeling the Jetty A's northern side is the right place. The house reef is a short swim away from your Water Villa. The Water Villas come with the best views you could ever imagine, a large bathroom, private water garden, over water relaxing platform with daybeds, aquarium dining with glass table, private pool. Laamu Water Villas also benefit from champagne on arrival, breakfast served in villa at no extra cost and hammocks on large deck to enjoy spectacular views. In room facilities, Nespresso coffee machine, still and sparkling water, mini bar, TV and DVD/CD player etc are also first rate. Amenities are also spot on and plentiful. Staff is always on call to resupply and in almost every case they resupplie before you'll need to ask. Six Senses Laamu always plays on a journey of senses and this is brought to the forefront when it comes to dining. With six restaurants and bars the resort puts health and freshness at the epicenter of its culinary philosophy. Six Senses Laamu's restaurants and bars have been designed to take maximum advantage of the island's idyllic beauty with panoramic views and spectacular sunrises and sunsets. 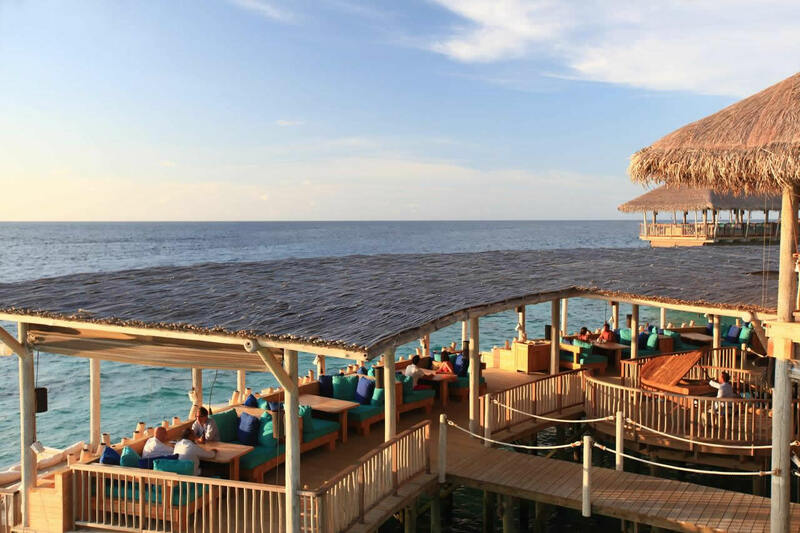 Most are over the water making The Laamu's restaurant and bar scene the largest of its kind in the Maldives. The Chef Stefan whom mostly know from the islands Baros and Gili Lankaanfushi is extremely supportive, cooking on a high end level standard and following up with all the guest's requests. Vegetables and herbs are grown on-site where possible and, if you don't mind munching on fish you may well have seen earlier in the day around the reef, the seafood is first rate. The Chill Bar is the best spot to take in the epic sunsets, Leaf offers the finest dining options, and Longitude - a great spot for catching a glimpse of dolphins - serves sprawling breakfasts. Perhaps best of all, there's a bottomless ice-cream stand with more than 40 flavours on offer. It is quite easy to skip the lunch after trying the breakfast where you will get lost in the varieties of honeys, jams, bakeries, juices, cheeses ...! And if you are lucky, you will be able to see the spinning dolphin while eating your croissants! The extensive breakfast list of juices comes with individual descriptions of use and value. Pretty much if you want a special food they will make it for you. As of September 2018, Six Senses Laamu no longer serves shrimp or prawns in either its guest restaurants. This represents a small dent in the global demand, but a powerful statement in eco sustainability. Stefan Goechke, Executive Chef at Six Senses Laamu, says he welcomes the challenge of adapting the resort’s menus so that guests won’t even notice the absence of prawns. The chef's team is working on some exciting new dishes to delight the guests. The LEAF restaurant is a symphony of rustic wood and palm-thatched roof perched above the resort's organic garden. The mushroom hut and chilli table are also spread out around and below the Leaf. The restaurant serves fine dining cuisine using the freshest possible ingredients, picked and caught only hours before it is served. European chefs work closely with Maldivian fishermen and farmers to source local ingredients picked or caught just hours before creative transformation into inventive Mediterranean dishes like tomato gazpacho with cucumber jelly and seared rainbow runner with parmesan gnocchi, piquillos and provençal sauce. Lunch is cooked before you from the ingredients you choose. Dine among friends or make new ones at the Chilli Table, set among the dozen varieties thriving in the chilli patch. Zen Restaurant offers a modern twist on a traditional Kaiseki menu, including the finest sushi and sashimi. The great breakfast spot, Longitude is the international over water restaurant with à la carte menu offering salads, fresh fish and pasta as well as a large selection of Asian dishes and daily changing menu from the Executive Chef. Altitude is a 6.4 metre tower of spun glass, rising high out of the sea – a wine ‘cellar' as never before seen. As well as 400 different labels it has an all important tasting table and deli. Chill Lounge & Bar is built over the water and on several levels with a world class cocktail list. Chill Bar is perfect for sundowners and chillaxing after an eventful busy day swimming, eating and sleeping! Ice is an al fresco ice cream parlour. With forty plus ever-changing flavours on a tropical isle might encourage some to stick with sorbet. For them Laamu makes enticing licks like mango jasmine and pink guava. Everyone else can indulge daily and nightly too in more decadent homemade ice creams including banana dark chocolate, green apple and salty caramel. Top that freshly made waffle cone with gooey chocolate sauce, sliced nuts or colourful candies. Crave more sweet treats? Enter the chilled Chocolate Studio where the pastry chef infuses chocolate truffles with cinnamon, green tea, lavender and mint mojito. Family-friendly? Yes, but honeymooners make up a majority of bookings. Six Senses Laamu have a children's club called The Den, which is professionally managed with a wide range of activities and games. Babysitting services are on request. Around the resort and in the villa children's toys, high chairs, baby cots, family activities and hammocks are available on request. Children have a choice of outdoor and indoor games. If they are able to swim well, and with the permission of the parents, they can go snorkelling to see the wide variety of sea creatures in the island's house reef. Family holidays like these are priceless ... and worth the travel time and effort. The Den Children's Club activities include: outdoor games (ball games, frisbee, swings, climbing ropes, monkey bars); indoor games (puzzles, blocks, cars, darts, board games; movies); beach play; treasure hunting; plants & animals, ping pong; cookies, cupcake and pizza making; arts and crafts (paper bead jewellery, coconut shell turtles, wind chimes, zoo animals, sail boats, hand-print craft, painting, drawing); dancing; playing music; snorkelling and swimming (with parents permission). Snorkelling equipment, including masks, fins and snorkels, is offered to all guests on a complimentary basis. The house reef is the most popular spot for snorkelers, as they can explore its busy marine life. Guests can also enter the water off the stairs of the Chill Bar and follow the reef slope. Six Senses Laamu is surrounded by a large variety of coral reefs to which guests can dive, based on their level of dive experience. For beginners, the house reef is beautifully sloping with three pinnacles standing just a few metres away, and is home to the resident green turtles and many colourful reef fish. Inner reefs are a 10 to 20 minute boat ride away, and each has its own unique features such as black coral walls, caves and anemone gardens. In the outer reefs, divers can cruise or drift along loping reef walls where friendly reef sharks and turtles usually pass by. The larger marine life, such as grey reef sharks, eagle rays, huge schools of snappers, and barracudas reside in the channels. At Manta Point (also known as Hithadhoo Corner), there is a manta ray cleaning station just five minutes away from the resort. Here guests can observe the resident manta ray population all year round, along with reef sharks, turtles and a huge diversity of marine life. Both the channel and the Manta Point dives are recommended for experienced divers only. For those who wish to learn how to dive with Deep Blue Divers, the dive centre offers PADI courses and Open Water, Advanced Open Water, Rescue Diver and Dive Master certification. Deep Blue Divers, the dive centre at Six Senses Laamu has expanded the array of unique activities offered to their little guests by introducing PADI Seal Team, a special programme designed for children keen to discover the adventures of scuba diving. Through a series of AquaMissions in the PADI Seal Team programme, young guests of Six Senses Laamu can discover the hidden beauties of the magical underwater world and learn to float effortlessly like a weightless astronaut. Little VIPs of age eight and above are eligible to sign up for the PADI Seal Team and this course nicely complements the PADI Bubblemaker course also offered at the resort. You can’t come to the Maldives and not try surfing. Without a doubt the area is a surfer’s paradise. There are so many waves to choose from. Add to that the seclusion of Six Senses Laamu as the only resort on the atoll, plus expert guiding, and you have a quintessential Maldives surfing experience in the making. Six Senses Laamu has a partnership with Tropicsurf, a world-renowned surf company with a roster of 50 specialist coaches stationed in nine different countries. 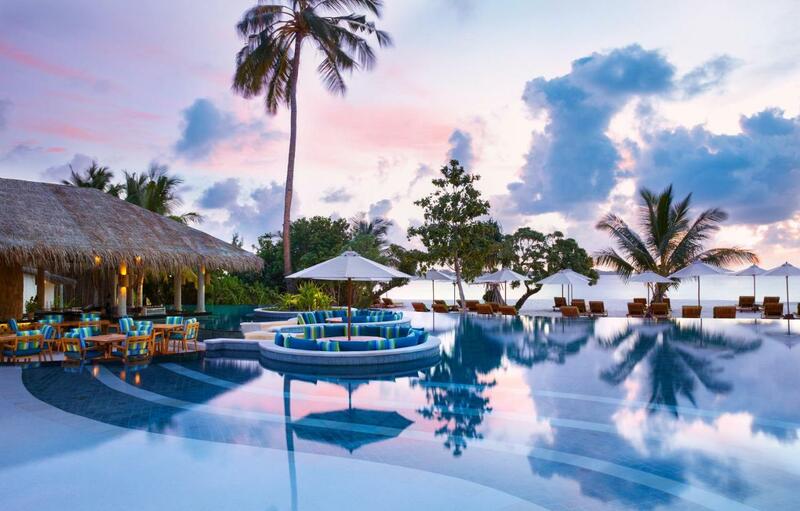 Both Tropicsurf and Six Senses Laamu share a common vision: reconnecting people with themselves, others and the world around them and at the same time delivering out of the ordinary guest experiences. So with professional guides based on property year round, it is assured there is an expert smiling face upon arrival dedicated to delivering surfing triumphs. Being the only resort in the atoll, Six Senses Laamu offers the chance to its surfing guests to almost exclusively enjoy the surrounding surf breaks. 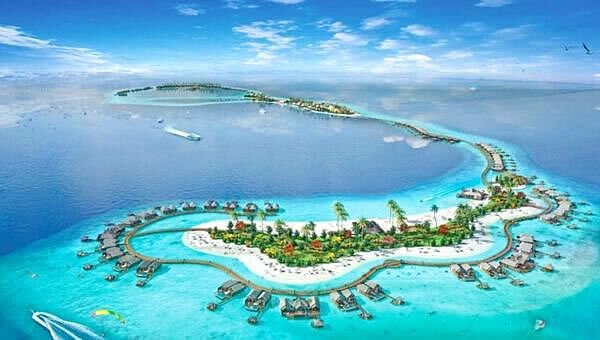 One of these breaks is the Yin Yang, a renowned surf break in the Maldives which is just a five-minute boat ride away. For those who want to discover the surfing experience a beginner’s break is just off the shore. 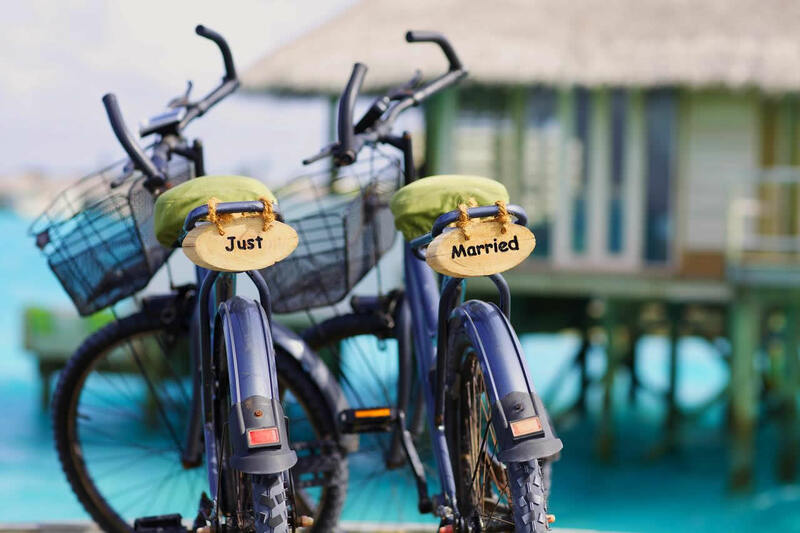 Be a castaway for the day and spend a magical moment on your own private island where you can travel by bicycle from one end of the island to the other and they are given for free. Activities which you can partake in during your stay at Six Senses Laamu include swimming, water skiing, island excursions, picnics, an exciting fishing, wonderful spa, good snorkelling and 5 * diving center, incredible dolphin safari, modern gym, pavilions for yoga, and for your child there is a children's club with a lot of exciting entertainment. Twice a week there is a mini-cinema open air under the stars, and once a week on the beach a hot cocktail party lights up ... of course with the best music. Kitesurfing is a specialty here but it's paddle boarding and surfing that has really made a name for Six Senses Laamu. There are a couple of useful nursery waves and then there is Yin Yang, the atoll's most famous break. The wellness principles extend to inviting world authorities in many related fields. Yoga and Tai Chi is led by the in-house tutor on a lovely platform above the hi-tech gym. At Laamu you never need be bored, because even in the rainy day or in the unlikely scenario where you want to stay connected to the outside world, you can browse their seaside library with international newspapers, engrossing beach reads, movies and tunes plus complimentary computers with high speed internet. Laamu’s sublime setting distracts from the burn in the waterfront gym with Techno-gym cardio machines and sea facing Kinesis personal fitness equipment. On the upstairs deck, the sound of waves equally inspires restorative meditation and invigorating yoga, available by scheduled classes or private appointment with in house experts. Sitting on the beach, the Six Senses Spa offers five secluded treatment rooms plus two single and two double treatment nests within the island's natural vegetation. Highly skilled therapists use fresh natural products to provide a comprehensive range of award-winning signature treatments plus rejuvenation specialties of the region. Visiting practitioners offer guests lifestyle consultations and specialized holistic treatments, some of which include acupuncture, cranial sacral therapy, reflexology, acupressure, Reiki and shiatsu. At Six Senses Laamu, your stay can be anything you want it to be. Six Senses Integrated Wellness brings together the latest technology and in-house expertise with personalized wellness programs and nutritional advice. The program includes: Wellness screenings and Wellness retreats, from three days plus. These programs are tailored around the most common concerns and include: Sleep & Resilience, Trim & Fit, Cleanse & Detox and live to your full potential. If you are looking for a place where wellness, excellent food and paradisiac landscapes, you might fall in Love with the Laamu! Unsurprisingly, the reviews of the Six Senses Laamu are almost universally exceptional. The Six Senses resorts are famous for quality and attention to detail for those who can afford them, and reviews for this new resort are gushingly positive. Guests love the remoteness and the casual atmosphere plus the huge and well appointed water villas. The food also gets great praise with many people noting the diverse menu choices that are hard to find at many Maldives resorts. The diving and other water sports also get very high marks here so if you like the list of things they are offering and the price is right then reading the reviews will confirm that this is the right resort for you. We can just recommend you all to go there. You just have to experience this on your own. Another positive point and USP: the favourite spot for all the guests are the ice-cream bar completely free of charge! About 30 sorts of ice-cream, thats a real highlight! 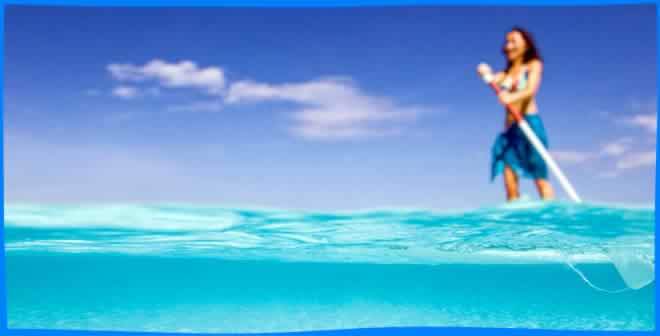 Both water and beach villas offer great view on the blue sea and don’t miss the snorkelling, you will have a blast. The Sustainable tour where you can discover all the initiatives launched by the resort. Very inspiring and impressive. The food is a really delicious and you probably don’t want to miss their Asian buffet on Fridays! The wine list across the island - extensive and approachable. All of the restaurants are superb at Six Senses Laamu but Leaf deserves a special mention, absolutely superb. Very expensive, but if you can afford it, you need to run there screwing up your eyes, then gently open them and discover a real paradise around you. Facilities mostly ok, but a little bit out of time compared from state of the art islands at Maldives opened in the last 3 years. During underwater snorkelling in front of the water villa you don't see any fishes but there are beautiful house turtles which coming every afternoon. Visit during the summer months to witness turtles hatching - Laamu has several females that return each year to lay their eggs, which then hatch at night during July and August. If you lucky you'll have the chance to witness sea turtle hatchlings being guided into the ocean (be prepared to wake up at around 2am but it is truly one of the most wondrous experiences). Register your interest on arrival so as not to miss this incredible sight! The ice cream shop is amazing! With 42 different homemade flavours, you'll never have to try the same one and you can go back as many times as you like! Visit the amazing over water chocolate shop! After a 12 hours trip from Europe, arriving Male International airport, you need another hours to finally arrive the island including another local flight (50 min) and an additional speed boat trip (25 min)...finally and additional check in procedure....... not worth to do it for a trip shorter than 8 days! 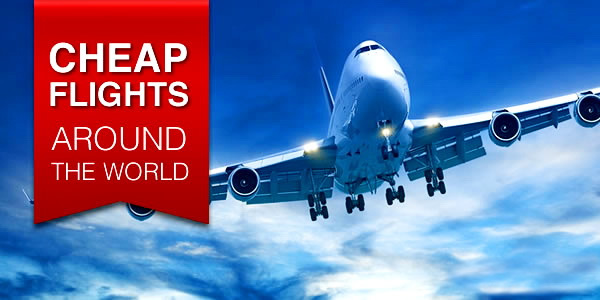 (for a short stay you can check out the list of 10 best resorts near Male airport)! Good advice is to grab in a water villa on Jetty A about half way down facing Jetty B. This is because there is sea grass here and you can see Turtles feeding/swimming everyday. The rooms have two important flaws (for some): (i) there are two mean steps on each side of the bed, that are unavoidable to get in and out of the room, or to go to the washing area and the bathroom. Since almost nobody is used to minding steps in one's own bedroom, those are a constant and effective threat to your feet or equilibrium (ii) if you don't manage to get yourself injured in the room, you have another excellent chance in the shower: the floor in the showering area is so smooth that, when wet with water and soap, becomes potentially lethal. Sandbank dinner - worth every penny/cent for an amazing private experience. Laamu is the one place where you can shower in open-air bamboo encircled privacy then climb to the treetop deck for a uniquely Maldivian panorama of emerald jungle to sapphire seascape and unobstructed equatorial sunset. Younger guests have their own place to play with native touches like Maldivian hammocks over the sand. Dining at Laamu is also a dazzling experience. Chances are, you will want to try all of their outlets before you leave. The Altitude, rising 6.4 metres above the Indian Ocean, is one-of-a-kind sunlit, spun glass wine tower that holds 400 Old and New world vintages, half of which are organic. Many are otherwise unavailable in the Maldives. Further into Laamu's lagoon where Napoleon wrasse and parrotfish swim along a spectrum of thriving coral is Deck-A-Dence. The six glass aquarium tables above the sea are boasted as the only spot in the Maldives to dine on a zero carbon menu. 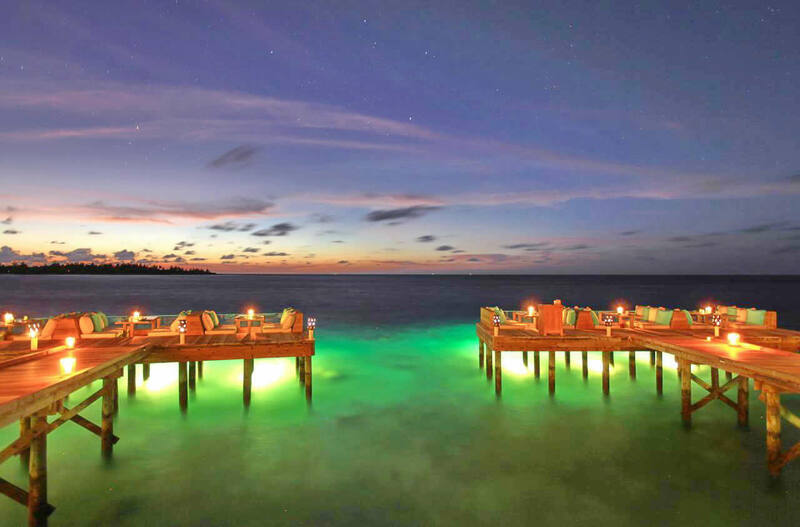 While stars illuminate the scene from above and waves lap soothingly underneath, feast on inventive, entirely local fare like grilled reef fish over a fire of coconut shells with Maldivian spices, coriander and lime, a memorable meal as groundbreaking as it is gourmet. Spot dolphins while cruising the open sea, or head underwater to snorkel day and night among staghorn and mushroom corals with Laamu's resident marine biologist who knows where green turtles and eagle rays roam along Laamu's teeming house reef. You can shop for chic, ethically sourced souvenirs in the adjacent Six Senses Gallery. You can also get their famed organic cotton bedding there. Island boutique is also a good place to shop for a special memento of your stay. If you are more of an athlete and if you enjoy riding with the waves then ride the Maldives' famous Yin Yang wave, an eight-foot break just off Laamu's palm fringed shore. Laamu's surf coach helps first timers stand up on paddleboards then conquer the beginner wave also in their midst. You should try Kite surfing from a nearby sandbank, after a romantic breakfast or before a private dinner picnic on its intimate shores. In Laamu's accommodations design details that evoke the golden age of exploration conceal modern technologies like flat screen swivel televisions and Bose entertainment systems with fully loaded iPods plus docking stations. All guestrooms inside and out can access Laamu's complimentary high speed wireless internet.